The Egyptian Minister of Tourism: "I invite our Russian friends to come to visit us again and again." 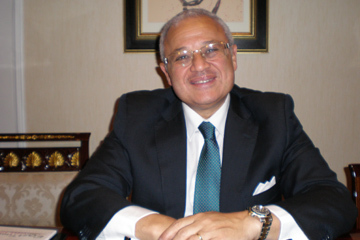 During an official visit to Moscow, the Egyptian Minister of Tourism of the Egyptian Arab Republic, Hisham Zaazou, despite a busy work schedule, kindly agreed to answer questions put to him by an observer from “International Affairs" magazine. “As you know, on June 30th Egyptians took to the streets demanding change, with the slogan: "We do not want to wait another four years!” (Meaning that the next presidential elections in Egypt, were not to be held for another four years, and the people did not want to see President Morsi in power for so long - SF ). “I would like to say to your Russian readers, the people of Russia who want to go to Egypt as tourists, come to Egypt!" "I was asked to become the second wife ..."
456: 30 seconds to mars. The Egyptian Minister of Tourism: "I invite our Russian friends to come to visit us again and again. "1 October 2013: The Egyptian Minister of Tourism: "I invite our Russian friends to come to visit us again and again."! лучшие комедии. The Egyptian Minister of Tourism: "I invite our Russian friends to come to visit us again and again. ".